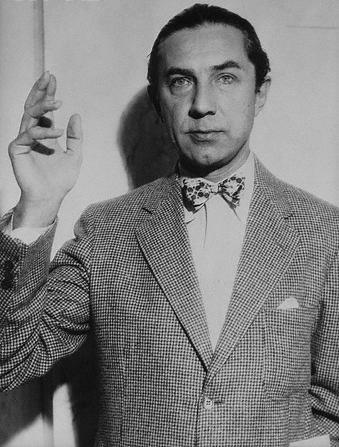 Fugitive from a hanging squad, with a price on his head! 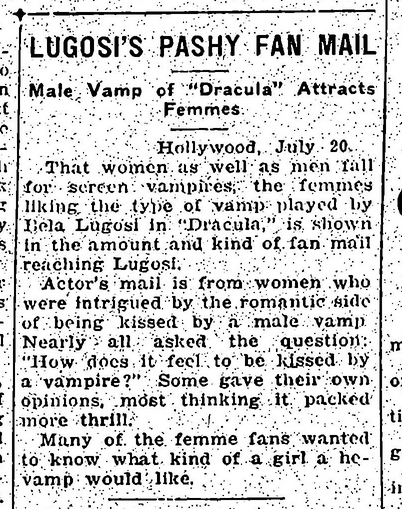 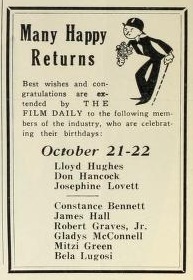 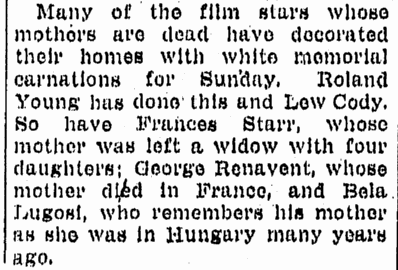 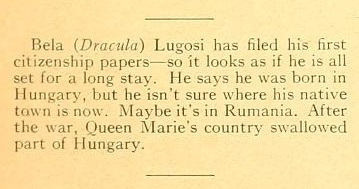 This was the rather unwelcome role which a few years ago was forced on Bela Lugosi, the famous Hungarian actor who is now appearing at the Richmond theatre in the title role of Universal’s sensational mystery drama, Dracula, by Bram Stoker. 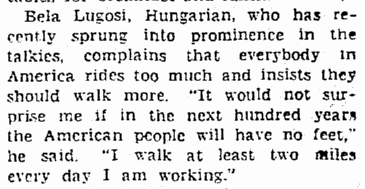 In the revolution in is native Hungary in 1918, Lugosi was one of the principal lieutenants of Count Karolyi, who seized the reins of government, and was given the newly created post of Minister of the Theatre. 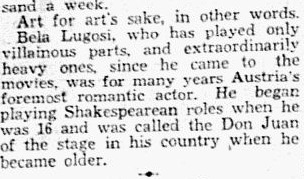 This was not only because he had been the theatrical idol of the country, appearing as leading man for many years at the National Theatre in Budapest. 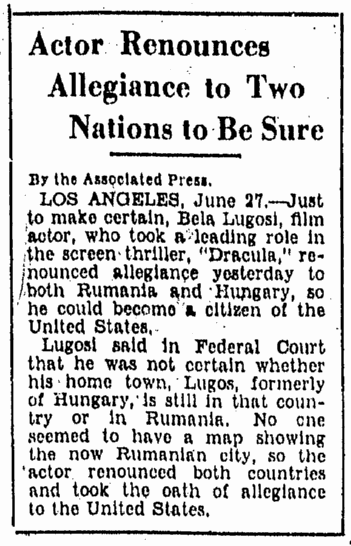 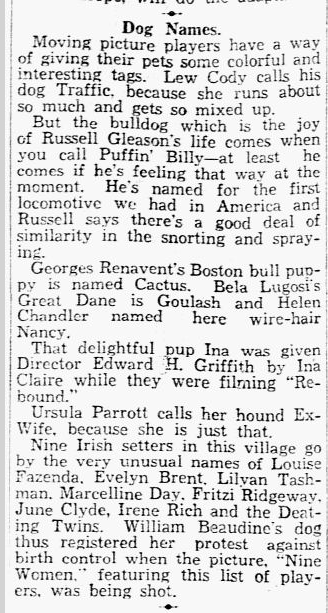 Los Angeles, June 27 (AP) – Just to make certain, Bela Lugosi, film actor, who took a leading role in the screen thriller “Dracula,” renounced his allegiance yesterday to both Rumania and Hungary so he could become a citizen of the United States. 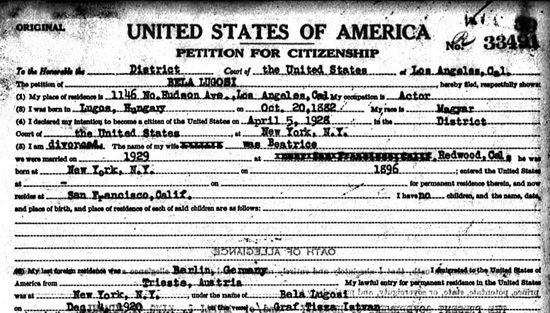 Lugosi said in Federal Court that he was not certain whether his home town, Lugos, formerly of Hungary, still is in that country or in Rumania, so he would renounce both countries and take the oath of allegiance to the United States.